Water Purifications that will stay with you for a lifetime. Bicycle rides through the rice paddies. Yoga at sunrise. Meditation at sunset. Come away for a rare and exclusive immersion into the Spirituality, Art and Beauty of Bali, island of the gods. November 5 - 11 2018. Ubud, Bali. Followed by 2 Nights snorkelling/mangrove exploring on nusa lembongan island, a fast boat from Bali. Lisa's guided retreat ends Nov. 13, 2018. Be independent, while being part of a group of fantastic women. 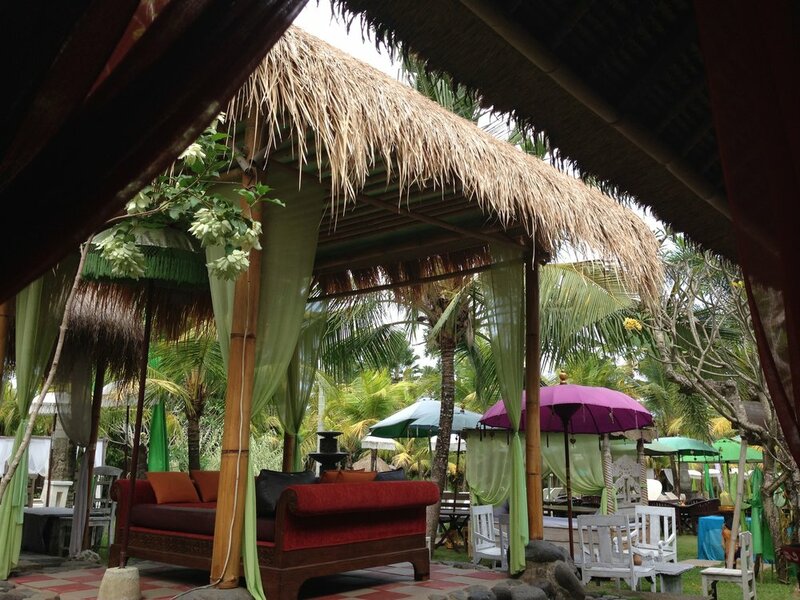 We'll be staying within the cultural heart of Bali. where authentic architecture and historic Bali temple art will engage all of your senses, along with organic food, spa experiences, pool and palm thatched yoga studio. Tirta Empul, Bali, is one of the largest and most sacred water temples in Indonesia. The temple was founded in 926 A.D. and is dedicated to Vishnu, the Hindu God of Water. We'll be joining locals in our sarongs, bringing floral offerings and performing cleansing rituals with water fed from a natural spring. Given its culture of design, craft and authentic construction techniques, Bali offers sumptuous architecture showcased throughout the island. Bali is a place of deep spirituality and exquisite, ongoing expression of the arts. We'll be visiting holy shrines and sacred baths for water purifications, some of them dating back to the 11th century. This one, Pura Gunung Kawi, located at the base of a valley, features meditative caves, epic stone walls and a temple carved out of the rock. Experience the colours of Bali: the rudraksha seeds fresh from trees that are peeled to create mala beads; the flowers for offerings to family health and happiness we can make altogether; the Bali Starling - seen here at the Bali Starling Conservation Project at Green School, another place we'll be visiting for its inspired bamboo architecture. We'll be hitting the beaches, and trying some surfing, in Seminyak and Kuta. Let's hop in a fast boat to Nusa Lembongan to experience more beaches and fantastic snorkelling...rich coral colours, exotic fish and, if we're lucky, a chance to swim with MantaRays.